National Bike Month is here! Welcome to another edition of National Bike Month! Bike Month may not feel particularly special to those of us who are year-round commuters…however, this is a great time to encourage folks “on the fence” to give bike commuting a try. You HAVE signed the People For Bikes pledge, haven’t you? If not, click here to add your name. And, as always, the League of American Bicyclists has provided a handy web app to help you find bikey events in your area. Simply visit this page and fill in the form to find some great things going on this month. Finally, if you’re new to commuting and new to this site, welcome! Please take a look around; we’ve got over seven years of articles to wade through in our archives…including tips and advice on just about anything you can imagine. 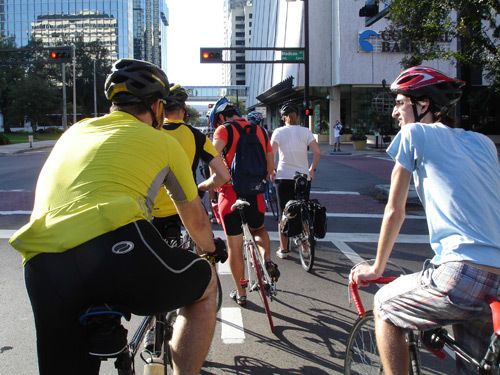 For more information on events taking place in and around Jacksonville, please visit http://www.jacksonvillebikemonth.com/. Literally…it’s already in the 90s here, so don’t forget your waterbottles! Saturday 5/22 Hub Grub II Bicycle Ride, 3-6pm visiting various restaurants in Seminole Heights, sponsored by the Seminole Heights Bike Club. Lots of good times to choose from…hopefully I’ll see some of you at these events and out on the road enjoying Bike Month! If you’re new to commuting and just discovering us, take a look at our extensive archives by browsing the category list at the lower right column of our homepage…we’ve covered a LOT of territory in the past few years, including advocacy issues, news and events, product and bicycle reviews and plenty more. And, if you’re doing something special to celebrate National Bike Month — a group event, personal goal or anything else — please let us know about it in the comments below.